Uhm Jung Hwa revealed Seo Jang Hoon used to date one of her good friends. 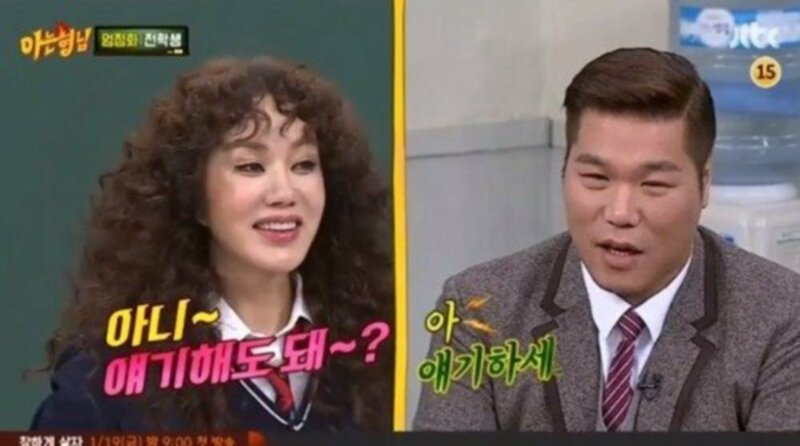 On the January 6th installment of 'Knowing Brothers', Uhm Jung Hwa featured as a guest, and she decided to poke fun at Seo Jang Hoon, saying, "I used to have a friend who was very pretty. You dated her for a bit, didn't you?" Seo Jang Hoon responded, "She was your friend, noona. But she lied about her age to me at first," adding, "We dated well, but I didn't even know she was your friend." As expected, Kang Ho Dong took the opportunity to poke fun, asking, "Was she your first love?"